The Fat Quarter Shop and John Adams aka Quilt Dad have teamed up to present you with a Fat Quarter Shop Exclusive! John has specially selected 12 of his favorite prints along with 3 coordinating solids from our store for this special bundle you will only find at the Fat Quarter Shop. 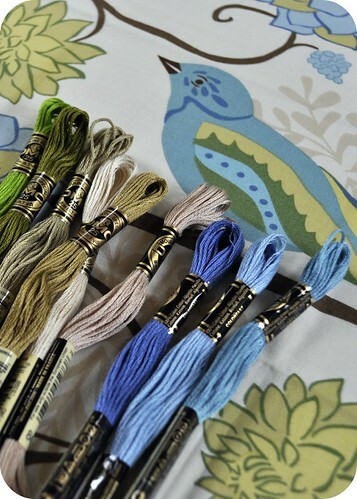 What will you be making with your Blogger’s Choice Fat Quarter Bundle? What quilt project are you currently working on? I'm a bit behind on all of my projects at the moment, having moved to a new house last month. Many of my sewing boxes -- including all of my fabric boxes! -- are not yet unpacked, so I am going into a bit of withdrawal. I'm sure I'll find a few WIP's that I have since forgotten about, but I know I need to finish up this charity quilt, catch up on my Farmer's Wife Quilt-along blocks, start a few items for a Triangle Modern Quilt Guild swap, and finish up a new free quilt pattern for a project made with Laurie Wisbrun's fantastic fabric. I'm also leading up a fun embroidery stitch-along over on the Feeling Stitchy blog this month and invite you to come join us! Leave a comment on this post choosing one of each pair you think John would have selected. Answer correctly and you will have a chance to win one of his Blogger’s Choice Fat Quarter Bundles.